Poster produced for the Southern Railway (SR) to promote the latest electrification work taking place on the network. 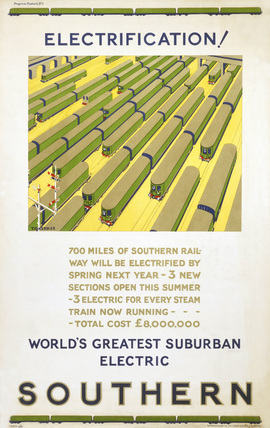 The text beneath the picture announces that 700 miles of Southern Railway will be electrified by the following spring and that three electric trains for every steam train are now running. Artwork by T D Kerr.